Father Ambrose at his last service. 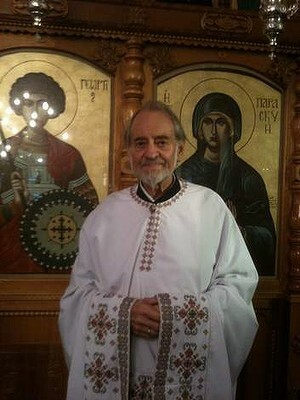 Two funeral services for the Very Reverend Archpriest Ambrose Trevor Jackson, one in Adelaide and the other in rural Victoria, were attended by clergy and parishioners from the Serbian, Greek, Russian, Antiochian and Romanian Orthodox as well as Coptic, Anglican and Catholic churches. The diverse congregations demonstrated the connections Father Ambrose had made in an unusual life journey. Ambrose Trevor Jackson was born in Fairfield. He was brought up as an Anglican, educated at Ivanhoe Grammar School. After graduating from the University of Melbourne, he embarked on a career as a teacher of history, English and, occasionally, music. After a few years he left for England. There a friend took him to Great Vespers in London’s Russian Orthodox Cathedral. He said he had ”never experienced such beautiful worship” and, though he continued to attend Anglican services on Sundays, he made a practice of going to the Russian Orthodox Cathedral on Saturday nights. When he returned to Melbourne, teaching at his old school, he joined a group called the Anglican Orthodox Fellowship, made up mainly of Anglican and Orthodox priests who met to discuss their beliefs and ways of worship. These meetings always began with a service in one of the city’s growing number of Orthodox churches. In 1975, after teaching in Sydney and Ballarat, he took up an appointment in Timaru, a port on New Zealand’s South Island, as headmaster of a secondary boarding school for girls. He also had musical commitments there, as in all the cities in which he taught. He had been organist and choirmaster at Holy Cross in the St Pancras area of London, then at Knox Grammar and Ballarat Grammar as well as at Anglican churches that included Christ Church in Brunswick, St Cuthbert’s in East Brunswick, St Anselm’s in Middle Park, and Ballarat Cathedral. While in New Zealand he presented for ordination in the Anglican Church, having obtained a diploma in theology from the Australian College of Theology in Sydney. He was ordained in Christchurch in 1981, at the age of 45. He then took on parish work in addition to looking after the girls’ school. Back in Melbourne once again, he became chaplain of Mentone Girls Grammar, followed by 12 years as senior chaplain at Brighton Grammar, where he also taught. As in New Zealand, he served as an associate priest in several parishes. In 2000, at the age of 65, he retired from school life. Hardly had he done so than an old friend who was then bishop of the Murray, a diocese on the eastern side of Adelaide, offered him the parish of Strathalbyn. He accepted, becoming a full-time parish priest for the first time. Over the decades Father Ambrose had kept up his association with the Orthodox Church. Many of his friends were Orthodox, several of them priests. He also had a long connection with the English-speaking parish of the Holy Trinity Russian Orthodox Church in Melbourne, having attended in 1988 the first meeting for its establishment, and later coached the choir for its first church service in English. He was also a dedicated iconographer, and in Strathalbyn was directing an icon school he had established, following on from other icon schools he had directed in Eastern Hill and Murrumbeena. More importantly, in his personal spiritual practice he felt himself being drawn to the Orthodox life: ”My private prayers were really Orthodox prayers,” he said. During his time in South Australia, Father Ambrose had become increasingly disturbed by developments within the Anglican Church – in particular, the ordination of women and liberalisation of its theological outlook and morality. Finally, he decided he could not remain in the church. However, he was bound to it in many ways: he was a ”rural dean” (a priest in charge of a group of parishes); a member of the diocesan synod; president and chairman of a panel of priests who recommend candidates for ordination; and had been made a canon (a title of honour for senior priests) of the Murray diocese. It took him more than nine months to free himself of his commitments and able to resign from his parish, after almost eight years there. In 2008 he was received into the Russian Orthodox Church at a monastery at Monarto, near Adelaide, where he and his wife and son had been going to services for some time. He was now a layman though, and there was no indication from the Russian Orthodox Church that he was seen as a candidate for priesthood. Then a year-and-a-half after his admission to the Russian Orthodox Church, Bishop Irinej Dobrijevic, bishop of the Serbian Metropolitanate of Australia and New Zealand, contacted him to ask whether he would be interested in ministering in the Serbian Orthodox Church. He replied that he still felt the call to the priesthood but knew nothing of the culture of the Serbian church. That did not matter, Bishop Irinej said; he would learn as he went along. He suggested that Ambrose join a parish in Adelaide, St Sava in Hindmarsh, where the priest, Father Slavko Kasikovic would give him all the help he needed. Father Slavko did indeed, treating him like a brother from the beginning. In 2010, Father Ambrose was ordained a priest of the Serbian Orthodox Church, becoming only the third former Anglican clergyman to follow that path. He conducted services in English but had begun learning Serbian. Late last year, he was admitted to hospital for an emergency operation after being diagnosed with bowel cancer. He returned to parish work after being discharged and, with the aid of painkillers, led a fairly normal life. However, seven months after leaving hospital he woke one morning in great pain and unable to walk. Three months later Father Ambrose died peacefully in a nursing home in Mount Barker, South Australia. Only weeks before his re-admission to hospital, on a particularly holy day in the Serbian Orthodox calendar, Father Ambrose had been attending the ordination of a student of his at Elaine (a town between Geelong and Ballarat) when, quite unexpectedly, he found himself the centre of attention in a ceremony conducted by Bishop Irinej to elevate him to the position of archpriest. Bishop Irinej had not planned the event. It was as if he had sensed during the service that Father Ambrose was close to death and that this would be the last opportunity to honour him. In his final weeks, Father Ambrose prepared an account of his life, which he finished with these words: ”That was my physical journey. As far as Orthodoxy is concerned, I must say I have never been more happy in my life. I am so glad that God brought me into the full life of the Orthodox Church. I am so grateful to Him, too, for allowing me the privilege of continuing in the priestly ministry in the church.” He said he and his family had arrived in their ”true spiritual home”. Father Ambrose is survived by his wife Margaret, their son Patrick, and his daughters Samela and Bridget.